Liner notes for ‘Warumpi Band 4 Ever’ complilation. ‘Jailanguru Pakarnu’ blasted out on the airwaves in 1983. Here was a new voice seldom heard: an Aboriginal voice. (Clinton Walker’s learned book ‘Buried Country’ dealt with those, but on the airwaves?) Pre Bicentennial. Pre Bridge walk. Pre Sorry Day. Pre Yothu Yindi’s ‘Treaty’ days. This was important, an exception to the rocking white way. To hear them for the first time in the cold evening air at the settlement of Docker River N.T. was a wow experience. 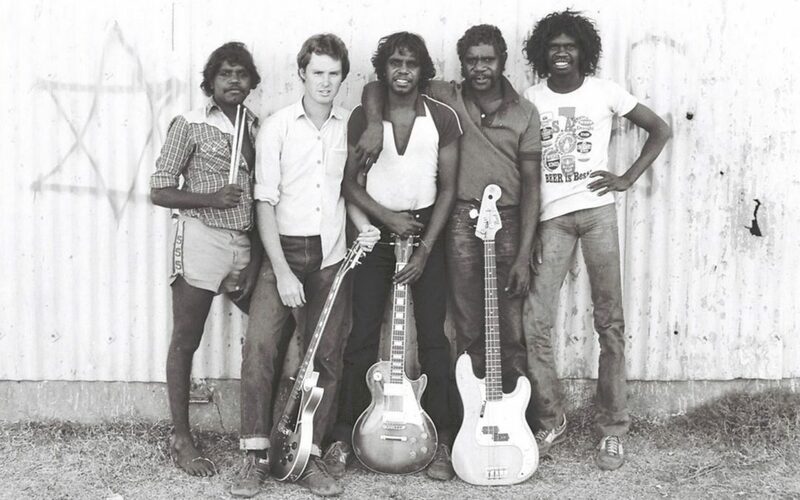 It was Midnight Oils’ first night out of ‘civilization’ on the “Blackfella Whitefella” tour with Warumpi and the crows ate our dinner. We thought it was safe from the dogs on top of the soccer nets. Well, it was that. But as the sun set and the cold rose from the ground, with dogs and kids in the red dirt and fire smoke, Sammy Butcher peeled wide eyed and sweet countrified licks from his Fender Bullet guitar (I never saw it in a case, it just travelled in the back of the truck.) Across the stage in dual guitar heaven stood song man Neil Murray, all cut off sleeves and Stratocaster, singing great backup and the occasional lead, and the rhythm section of Gordon and Hilary, that night, left The Stones in the shade. The singer and writer GR was possessed of a unique charisma, simply born to be on the stage. He owned it. The mantra of ‘You Gotta Be Strong’ was about his people standing up to the corrosion of their culture from within, and from a white society that would studiously avoid the Aboriginal gaze, alternately apathetic and well meaning but at best misguided, even hateful. The hook came back over again and over again until you were convinced, two eggs over easy. That was demonstrated in how they made us feel so at home and welcome as people in their country, around the campsites and in the sound checks, even in finding out we had different names for the constellations in the clear desert night sky. Something went down in the Western Desert. My wife and I named my son after Sammy. I have always and will always work with Neil if he’ll have me. I count them as family and hope they might feel the same way about us.